River Somer and War memorial at Midsomer Norton as at 2006. 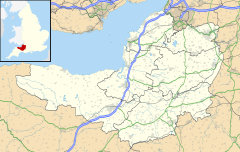 Midsomer Norton /ˈmɪdsʌmər ˈnɔːrtən/ is a town near the Mendip Hills in Bath & North East Somerset, England, 10 miles (16 km) south-west of Bath, 10 miles (16 km) north-east of Wells, 10 miles (16 km) north-west of Frome, and 16 miles (26 km) south-east of Bristol. It has a population of 10,997. Along with Radstock and Westfield it used to be part of the conurbation and large civil parish of Norton Radstock, but is now a town council in its own right. It is also part of the unitary authority of Bath and North East Somerset. Midsomer Norton is characterised by the River Somer which runs the length of the town centre, the river itself was regenerated with new plant life during the summer of 2012 in a bid to improve the aesthetics of the town centre. The Town has a long history which can be seen through a number of early churches which remain, but really started to grow and become a transport hub with the development of the Somerset coalfield. For many years the coalmines provided employment for local men until they ceased operations in the 1960s, around the same time that the town's two railway stations also closed. Afterwards, good employment opportunities still remained for the town with elements of the print industry, and although some of these plants have also now begun to close, overall employment levels in the area remain very high. Midsomer Norton provides shopping and service industries for the surrounding areas and supports several music venues and bands. The town has four primary schools and two large secondary schools. Midsomer Norton is home to a leisure centre, several sports clubs and provides youth opportunities such as Scouts and Guides. It has been the birthplace or home to several notable people. "Norton" means 'north enclosure' from the Old English, while the use of its forename to distinguish it from other 'Nortons' is of late origin and not mentioned until 1334. Sources point to the town being situated midway between two branches of the River Somer; the Somer itself and Wellow Brook, which joins the Somer a short distance to the east near Radstock. The spelling "Missomerys Norton" may be a variation. Eilert Ekwall wrote that the village "is said to be so called in allusion to the festival held at midsummer on the day of St. John, the patron saint." John Wesley wrote of the appalling local road conditions which ensured it was reachable "only in midsummer." As Simon Winchester notes in his book The Map that Changed the World, "...the roads on this part of Somerset were atrocious, thick with mud and as rough as the surface of the moon". In some church records the town is referred to as 'Norton Canonicorum' as an alternative to Midsomer Norton, and this may be because of the local Priory's link to Merton Priory in London until the dissolution of the monasteries in 1546. Around 1866 an obelisk Crimean War monument with two marble plaques, was built at the site of St Chad's well, by the mother of Frederick Stukeley Savage for the benefit of the poor. The obelisk was in the grounds of Norton House, a Georgian mansion built by Thomas Savage, an investor in coalmines in the area, in 1789. The house itself has since been demolished but other features of its estate are still visible at Silver Street Nature reserve (see below). There are two electoral wards in the town from which Midsomer Norton elects its own Town Council with an elected Mayor. It is part of the North East Somerset constituency, which elects a Member of Parliament to the House of Commons of the Parliament of the United Kingdom. It is also part of the South West England constituency of the European Parliament. On the southern fringes of the town is the 2 hectares (4.9 acres) Silver Street Local Nature Reserve, on the site of the estate of Norton House, an eighteenth century mansion built by the coalmine-owning Savage family but demolished in 1937-8. It contains a broad-leaf woodland around several ponds, a restored nineteenth-century wellhead that supplied water to the house, and a grassland field. The woodland is leased to the Somerset and Dorset Heritage Railway Trust by Bath and North East Somerset Council and the meadow in the stewardship of Somervale School. Along with the rest of South West England, the Midsomer Norton has a temperate climate generally wetter and milder than the rest of England. The annual mean temperature is about 10 °C (50 °F) with seasonal and diurnal variations, but the modifying effect of the sea, restricts the range to less than that in most other parts of the United Kingdom. January is the coldest month with mean minimum temperatures between 1 °C (34 °F) and 2 °C (36 °F). July and August are the warmest, with mean daily maxima around 21 °C (70 °F). In general, December is the dullest month and June the sunniest. The south-west of England enjoys a favoured location, particularly in summer, when the Azores High extends its influence north-eastwards towards the UK. Cloud often forms inland, especially near hills, and reduces exposure to sunshine. The average annual sunshine is about 1,600 hours. Rainfall tends to be associated with Atlantic depressions or with convection. In summer, convection caused by solar surface heating sometimes forms shower clouds and a large proportion of the annual precipitation falls from showers and thunderstorms at this time of year. Average rainfall is around 800–900 mm (31–35 in). About 8–15 days of snowfall is typical. November to March have the highest mean wind speeds, with June to August having the lightest; the prevailing wind direction is from the south-west. For many years, the centre of Midsomer Norton was prone to flooding. Sometimes several times a year, the Somer rose up during prolonged rainfall and flooded shops, particularly where the high street is at its lowest point in the middle between Martin's newsagent and the former Palladium cinema. To prevent future deluges, a major flood alleviation tunnel — completed in 1977 – was constructed beneath the high street to remove excess water when the town centre was threatened with flooding. The infrastructure comprises a sluice gate situated at the top of the high street near Somervale School through which the water is carried under the town via a pre-cast concrete culvert several metres in diameter to an outlet further downstream at Rackvernal. Since it began operation, no flooding has occurred to the high street and an Environment Agency report confirms that the relief scheme remains in good condition and continues to serve to its 100-year standard. The spoil heap, or batch, from local collieries, north east of the town. For hundreds of years mining was an important industry for the area, and there were a number of mines in Midsomer Norton, e.g. Old Mills, Norton Hill, and Welton. However the seams were thin and with the hilly nature around, not easily worked. Generations of miners who worked in the difficult conditions of the local collieries are remembered at the Radstock Museum. The coming of the railways, particularly the Bath extension of the Somerset and Dorset Joint Railway (S&D) in 1874, transformed the conveyance of coal out of the area. One of the town's most successful companies was Prattens, manufacturer of prefabricated classrooms, founded and run as a family firm from 1912. It was acquired by Beazer in 1980 before its main factory site in Charlton Road in the town was demolished in the 1990s. In recent years some of the larger firms have disappeared or relocated, with poor transport links being cited as a handicap. A large packaging company, Alcan Mardon closed in 2006, although the social club remains. Another extremely important plant, Polestar Purnell, based in nearby Paulton also closed the same year with the loss of 400 jobs. In August 2011, the town's largest remaining employer, Welton, Bibby & Baron, the largest producer of recyclable paper bags in Europe, announced the closure of its site in Welton, which it occupied for 150 years. The company, known locally as ‘Welton Bag’ planned to move to larger premises at Westbury in Wiltshire, but promised to transfer all 400 jobs to the new site. The business parks remain busy however, and the town and environs has its share of national trading companies including supermarkets and retail outlets. The town's High Street has free parking. Many inhabitants commute to Bath and Bristol for employment and shopping. The town was previously served by a station on the Somerset and Dorset Railway (S&D) but this closed in 1966, and by a second station on the Bristol and North Somerset Railway at Welton in the valley. The railways were separate, the S&D being administered by the Midland Railway and the London and South Western Railway companies (later the London Midland and Scottish Railway and the Southern Railway) and the North Somerset being run by and then owned by the Great Western Railway. The stations were both called "Midsomer Norton and Welton" (the B&NSR station was originally called just "Welton"); under British Railways, the S&D station was renamed as Midsomer Norton South after a short period as Midsomer Norton Upper; and is currently being restored with occasional open weekends with engines in steam. The Somerset & Dorset Railway Heritage Trust one day hopes to operate steam trains for a mile up to Chilcompton Tunnel but there remains much to do before this can happen. My kerosene motor-tanker had a tap at the back and when I rolled into Shepton Mallet or Midsomer Norton or Peasedown St John or Huish Champflower, the old girls and the young maidens would hear the roar of my motor and would come out of their cottages with jugs and buckets to buy a gallon of kerosene for their lamps and their heaters. It is fun for a young man to do that sort of thing. Nobody gets a nervous breakdown or a heart attack from selling kerosene to gentle country folk from the back of a tanker in Somerset on a fine summer’s day. The Waugh family connection with Midsomer Norton began when Dr Alexander Waugh, father of Arthur Waugh and grandfather of Evelyn Waugh and Alec Waugh moved to Island House, which had been built in the early eighteenth century, in The Island in the centre of the town in 1865. The family later moved to a house in Silver Street. As a boy, Evelyn Waugh spent his summer holidays in Midsomer Norton with his maiden aunts. He later described his visits there: "I suppose that in fact I never spent longer than two months there in any year, but the place captivated my imagination as my true home never did." The Palladium cinema was opened as the Empire in 1913 in a building which had previously been a brewery. It closed in 1993 and various attempts were made to turn it into a club and shop, before Wetherspoons announced in January 2015 that they had acquired the site and intended to seek planning and licensing permission to convert it to a pub, which opened in September 2018 with the name of the Palladium Electric in reference to one of the cinema's former names. The town was left without cinema for almost two decades. Cinema was brought back to the town under the Palladium name in 2012 with a new community cinema at the Town Hall. In 2013, permanent cinema equipment was installed in the building and an upgrade in 2018 saw new release cinema return to the town for the first time in 25 years. The town is commemorated in “The Sheriff of Midsomer Norton”, by Somerset band The Wurzels. Midsomer Norton hosts the only unofficial carnival on the West Country Carnival circuit. Originally, floats travelled through the main High Street but road improvements put paid to the larger vehicles and for many years the procession was held on the main Fosseway through Westfield. Since 2014 however, the carnival has returned to the High Street following changes made to the traffic layout. The town's free newspaper is the Midsomer Norton, Radstock & District Journal. The other local weekly paper is the Somerset Guardian, which is part of the Daily Mail and General Trust. The monthly magazine, the Mendip Times, also includes local features. Somer Valley FM (97.5FM and online) is the Community Radio for the district. There is also a community website where residents can discuss local issues called Midsomer Norton People. In 2016 the town's first LGBT Pride celebration event was held. The event was held again in 2017. On the first Friday of every month the Paradis Palm Court Trio perform free classical concerts in the Town Hall. Choir concerts (male voices in particular) command a local following and the Lions club is a promoter of such attractions usually held in the Methodist or Parish churches. There are a number of local brass bands. In 2006 Midsomer Norton hosted the European Open Marching and Show Band Championship which saw many bands from all over Europe visit the town. Anthony Horowitz, the original writer of Midsomer Murders, borrowed part of the name of the town when he adapted Caroline Graham's Chief Inspector Barnaby series for television in 1997. Although the series itself is primarily filmed in picturesque villages in Buckinghamshire and Oxfordshire, Horowitz chose the name after looking at a map of Somerset, believing that it sounded quintessentially English. Although no filming of the show has ever taken place in Midsomer Norton or the surrounding parishes, some names of other nearby locations have been used by the producers in creating their fictional county of Midsomer, including Midsomer Wellow (Wellow), Midsomer Magna (Chew Magna), Midsomer Morton and the main settlement of Causton (Corston). Despite some occasional confusion, there is no other link between Midsomer Norton and the television series. The Old Priory, which was a hotel and restaurant, dates from the early to mid 17th century. Another old building is the Catholic Church of the Holy Ghost, which is a 15th-century tithe barn converted by Sir Giles Gilbert Scott. It is a grade II* listed building. The local Catholic community are served by Benedictine monks from nearby Downside Abbey, coming under the Diocese of Clifton. The Anglican Church of St John the Baptist has a tower dating from the 15th century, although the upper stages are from the 17th century, but the rest was rebuilt in Gothic Revival style by John Pinch the younger in 1830–1831 and was extended in the 20th century with new chancel and lady chapel. It is a grade II* listed building. The churchyard includes a memorial to the 12 miners killed in 1839 when their rope was severed. St. John's is part of the Diocese of Bath and Wells. The Patronage vests in Christ Church, Oxford. The Methodist Church in the town's High Street celebrated its 150th Anniversary in 2009. In 1746, John Wesley's travelling preachers, based in Bristol were invited in the mid-1700s to support the local society, the man himself first coming in 1767. By the middle of the 1800s, the congregation had outgrown the original chapel erected in 1775 in Rackvernal Road (now demolished). In the 1990s, the present church building and adjoining hall were totally refurbished and linked, the facilities being well used by the local community. Local Methodists are part of the Bristol District of the Methodist Church and in the North East Somerset & Bath Circuit. The Baptist Church have their building in Welton but hold their Sunday morning service at Somervale School now in order to accommodate their congregation. The Salvation Army meet in their citadel at Stones Cross. There is a successful Scout group, the 1st Midsomer Norton Scout Group based at Radstock Road, providing scouting to around 140 boys and girls per week, and a similarly popular Guide group a short distance away at Rock Hall. First schools for children up to 11 include Midsomer Norton Primary, St. John's Church of England, Welton Primary, Longvernal Primary and Westfield Primary. In addition, St Benedict's Catholic Primary School on the edge of Midsomer Norton with a 'Midsomer Norton, Radstock' postal address, is actually part of the neighbouring Somerset County Council's education service. There are two local secondary schools. Norton Hill School has approximately 1,400 students from the age of 11 to 18. In 1999 it became a Technology College and in 2007 changed specialism to become a Maths and Computing College. In 2006 Norton Hill was also awarded a second specialism as a Language College. The school was described by Ofsted in 2007 as outstanding in every respect. The school has received both the Sportsmark Award by Sport England and Artsmark Silver Award. Somervale School which has foundation status, is a specialist Arts College. In 2008, the school was the first in Bath and North East Somerset to win the Eco-Schools Silver Award. The number of pupils on the school roll has fallen to 603. This fall prompted the school to propose a federation with nearby Norton Hill School in March 2009 called the Midsomer Norton Schools Partnership. This is now in place with Alun Williams as the overall head teacher of both schools within the federation. In October 2010 the federation was confirmed as an academy. Both secondary schools were awarded 'Good' by Ofsted in January 2013. The two schools share one sixth form called the Midsomer Norton Sixth Form which is based across the two sites. The town is served by a further education college, the Somer Valley branch of Bath College, in neighbouring Westfield. It serves 1,000 full-time students and 5,000 part-time students. The College has steadily expanded since it opened in the 1940s to serve the Somerset coalfields. As a Community College, it has expanded its range of vocational programmes, and has become an established part of the community. The college works with local employers to provide training programmes that meet the needs of both employers and employees. This ranges from short skills workshops, through to NVQs, BTEC, Higher National Diplomas and apprenticeships. South Wansdyke Leisure Centre provides a wide range of activities including swimming. Norton Hill and Somervale School also have sports facilities used by town and local groups. In 2010, additional leisure facilities were constructed including a skate board park and new children's play area. There are several football clubs including Welton Rovers F.C. who play in the Western Football League, Welton Arsenal, and Norton Hill Rangers. Midsomer Norton has its own Cricket club, as do Midsomer Norton Methodists, and a Rugby union team. In 2002 the World Professional Billiards Championship was held at the Centurion Hotel, part of L&F Jones, Midsomer Norton. Chloe Davies (born 1998), paralympic swimmer. David Fisher (1946-2013), award-winning artist. Jody Gooding (born 1981), professional beach volleyball player, lives in the town. Anita Harris (born 1942), actor, singer and entertainer. Bert Head (1916–2002), footballer for Torquay United and Bury FC. Denise Johns (born 1978), professional beach volleyball player for Great Britain who lives in the town. Gareth and Kim Paisey from indie pop band Los Campesinos!. ^ a b "Midsomer Norton Parish". Neighbourhood Statistics. Office for National Statistics. Retrieved 31 December 2013. ^ "Council make decision on Community Governance Review". Bath and North East Somerset Council. Archived from the original on 4 October 2011. Retrieved 7 July 2011. ^ a b Robinson, Stephen (2007). Somerset Place Names. Dovecote Press. p. 102. ISBN 1-874336-03-2. ^ Plea Rolls of the Court of Common Pleas; National Archives; CP 40/629; http://aalt.law.uh.edu/H5/CP40no629/aCP40no629fronts/IMG_0665.htm Archived 3 March 2016 at the Wayback Machine; third entry. line 3; the place where a trespass occurred, according to the plea. ^ Ekwall, Eilert (1960). The Concise Oxford Dictionary of English Place-names. Oxford U.P. p. 345. ISBN 0-19-869103-3. ^ Winchester, Simon (2002). The Map That Changed the World: A Tale of Rocks, Ruin and Redemption. Penguin. p. 55. ISBN 978-0-14-028039-5. ^ Historical Manuscripts Commission (1907). "'Index: L — R', volume 1". Calendar of the Manuscripts of the Dean & Chapter of Wells. pp. 625–657. Retrieved 14 March 2010. ^ "Historical Note". Midsomer Norton Methodist Church. Archived from the original on 25 July 2009. Retrieved 30 January 2010. ^ Robinson, W.J. (1915). West Country Churches. Bristol: Bristol Times and Mirror Ltd. pp. 48–53. ^ "Midsomer-Norton Monument and St Chad's Well". Images of England. English Heritage. Retrieved 30 January 2010. ^ "Ward/Parish List". Bath and North East Somerset. Archived from the original on 16 March 2008. Retrieved 18 January 2009. ^ "Somerset North East: New Boundaries Calculation". Electoral Calculus: General Election Prediction. Archived from the original on 14 February 2009. Retrieved 19 September 2007. ^ "Council Offices". Images of England. English Heritage. Retrieved 30 January 2010. ^ "Midsomer-Norton Town Hall". Images of England. English Heritage. Retrieved 30 January 2010. ^ a b "Rural Landscapes — Area 8 Farrington Gurney Farmlands". Bath and North East Somerset Council. Retrieved 10 December 2006. ^ "England's Lost Country Houses - Norton House". www.lostheritage.org.uk. ^ "Silver Street Local Nature Reserve, Midsomer Norton". Avon local nature reserves. Archived from the original on 23 September 2015. Retrieved 15 March 2010. ^ "The Azores High". WeatherOnline Weather facts. Retrieved 19 November 2006. ^ "About south-west England". Met Office. Archived from the original on 7 October 2008. Retrieved 21 May 2006. ^ a b "Strategic Flood Risk Assessment of Bath and North East Somerset Level 2 SFRA for Midsomer Norton / Radstock" (PDF). Bath and North East Somerset Council. Retrieved 8 August 2018. ^ "Bath and North East Somerset Flood Risk Management Strategy Report Final Report June 2010" (PDF). Bath and North East Somerset Council. Archived from the original (PDF) on 28 September 2011. Retrieved 7 August 2011. ^ "List of Mines in Great Britain and the Isle of Man, 1908". Coal Mining Resource Centre. Retrieved 12 November 2006. ^ "Peak District Mines Historical Society Ltd". Archived from the original on 15 July 2011. Retrieved 10 March 2010. ^ "Camerton". Flickr. Retrieved 13 June 2017. ^ Whitlock, Ralph (1975). Somerset. B.T. Batsford. p. 69. ISBN 0-7134-2905-4. ^ Collier, Peter (1986). Coliers Way — The Somerset Coalfield. Ex Libris Press. p. 33. ISBN 0-948578-05-X. ^ Down and Warrington, C.G. and A.G. (1972). The History of the Somerset Coalfield. David and Charles. p. 222. ISBN 0-7153-5406-X. ^ a b "Radstock and Midsomer Norton in focus". Business Matters in Bath and North East Somerset. Bath & North East Somerset Council. 2008. Archived from the original on 6 July 2011. Retrieved 14 March 2010. ^ "Bath and North East Somerset Core Strategy Launch document" (PDF). Bath and North East Somerset Council. 2007. p. 43. Archived from the original (PDF) on 13 August 2011. Retrieved 7 February 2010. ^ "Bath and North East Somerset Core Strategy Launch document" (PDF). Bath and North East Somerset Council. 2007. p. 23. Archived from the original (PDF) on 13 August 2011. Retrieved 7 February 2010. ^ "Midsomer Norton & Radstock Ring & Ride". Bath and North East Somerset Council. Archived from the original on 27 September 2010. Retrieved 20 September 2010. ^ "Midsomer Norton South Station". New Somerset and Dorset Railway. Retrieved 14 March 2010. ^ Yorke, Stan (2007). Lost Railways of Somerset. Countryside Books. p. 97. ISBN 978-1-84674-057-2. ^ "Chilcompton". Somerset & Dorset Railway. Retrieved 8 August 2018. ^ "Island House". Images of England. English Heritage. Retrieved 30 January 2010. ^ "Memories of nights at Palladium wanted". Somerset Guardian. Thbis is Somerset. 20 May 2009. Archived from the original on 15 September 2012. Retrieved 30 January 2010. ^ "Cinema". Midsomer Norton Community Trust. 2 June 2014. Retrieved 9 June 2014. ^ Somersetmade Ltd. "Wurzelmania: The Adge Cutler & The Wurzels Encyclopaedia. Made In Somerset! Songs by Adge Cutler and the Wurzels". Somersetmade.co.uk. Archived from the original on 10 September 2012. Retrieved 9 June 2014. ^ "Midsomer Norton People". Associated Northcliffe Digital Limited. Archived from the original on 8 March 2010. Retrieved 12 March 2010. ^ "Midsomer Norton to have its own Pride". ^ "1st Hook Scout & Guide Band". 1st Hook Scout & Guide Band. Archived from the original on 24 August 2011. Retrieved 7 February 2010. ^ "Romford Drum & Trumpet Corps win 4 gold medals at European championships". Romford Drum & Trumpet Corps. Archived from the original on 25 July 2011. Retrieved 7 February 2010. ^ "Bridge over the River Somer". Somerset Photos. Archived from the original on 4 March 2016. Retrieved 29 October 2015. ^ "The Moody Goose at the Old Priory". The Moody Goose at the Old Priory. Archived from the original on 7 April 2010. Retrieved 30 January 2010. ^ "The Priory". Images of England. English Heritage. Retrieved 16 March 2010. ^ "Church of the Holy Ghost". Images of England. Retrieved 10 December 2006. ^ "Church of St John the Baptist". Images of England. Retrieved 10 December 2006. ^ Scott, Shane (1995). The hidden places of Somerset. Aldermaston: Travel Publishing Ltd. p. 20. ISBN 1-902007-01-8. ^ "Benefice of Midsomer Norton with Clandown (no church)". Diocese of Bath and Wells. Archived from the original on 22 July 2011. Retrieved 15 March 2010. ^ "St John the Baptist, Midsomer Norton". A church near you. Retrieved 15 March 2010. ^ "Midsomer Norton Methodist Church Centre". Midsomer Norton Methodist Church Centre. Archived from the original on 25 July 2009. Retrieved 18 February 2009. ^ "School History". Midsomer Norton Primary School. Retrieved 12 March 2010. ^ "1st Midsomer Norton Scout Group". 1st Midsomer Norton Scout Group. Retrieved 23 September 2011. ^ "Education". Norton Radstock Town Council. Retrieved 13 June 2017. ^ "St Benedict's Catholic Primary School". Ofsted. Retrieved 8 August 2018. ^ "Norton Hill School". Norton Hill School. Retrieved 7 December 2007. ^ "Awards". Norton Hill School. Retrieved 8 August 2008. ^ "Somervale Wins Eco School Silver Award". Bath & North East Somerset Council. 4 November 2008. Archived from the original on 21 October 2011. Retrieved 6 June 2012. ^ "Welcome to Midsomer Norton Schools Partnership". Midsomer Norton Schools Partnership. Retrieved 9 December 2017. ^ "The Federation Celebrates 2013 Exam Results". Midsomer Norton Schools Partnership. Retrieved 7 January 2014. ^ "Sixth Form". Midsomer Norton Schools Partnership. Retrieved 7 January 2014. ^ "Norton Radstock College". The Independent. 22 June 2009. Retrieved 11 September 2009. ^ "Profile of Norton Radstock College". uk universities.net. Retrieved 11 September 2009. ^ "South Wansdyke Leisure Centre". South Wansdyke Leisure Centre. Archived from the original on 11 January 2010. Retrieved 30 January 2010. ^ "History of Welton Rovers". Welton Rovers FC. Retrieved 30 January 2010. ^ "Midsomer Norton Cricket Club". Midsomer Norton Cricket Club. Retrieved 30 January 2010. ^ "Midsomer Norton Rugby Club". Midsomer Norton Rugby Club. Retrieved 30 January 2010. ^ Sethi, Geet (18 May 2002). "Advantage Nalin Patel". The Hindu. Archived from the original on 6 June 2011. Retrieved 30 January 2010. ^ "Russell crowns himself with glory". Potting it right – Geet Sethi Column. Sportstar. 22 June 2002. Retrieved 30 January 2010. ^ "Peter Aexander". IMDB. Retrieved 20 September 2010. ^ Museum, Durham Mining. "Durham Mining Museum - Norton Hill Colliery Co". www.dmm.org.uk. ^ a b Stevenson, Graham. "Kay Beauchamp". Graham Stevenson. Retrieved 30 January 2010. ^ "William Dolman Bees". Find a Grave. Retrieved 30 January 2010. ^ "Bulleid and Gleeson 1849-1987" (PDF). Bulleid Family. Retrieved 1 February 2015. ^ "Don Carter". Post War English & Scottish Football League A — Z Player's Database. Retrieved 30 January 2010. ^ "PARALYMPICS: Chloe's London 2012 bid overwhelms proud mum". The Wiltshire Gazette and Herald. 25 August 2012. Retrieved 9 June 2014. ^ "David Fisher". Old Bakery Artists. Archived from the original on 3 March 2012. Retrieved 7 February 2010. ^ Patrick, Sean (18 December 2008). "Copley grad enjoying professional volleyball in Great Britain". Akron Ohio News. Retrieved 7 February 2010. ^ "Frederick Gould". Parry Tree. Retrieved 30 January 2010. ^ Aldrich, Richard; Peter Gordon (1989). Dictionary of British educationists. Routledge. p. 98. ISBN 978-0-7130-0177-8. ^ "Anita Harris". Internet Movie Database. Retrieved 30 January 2010. ^ "Bert Head". Post War English & Scottish Football League A — Z Player's Database. Retrieved 30 January 2010. ^ "Denise Johns". doosport. Archived from the original on 10 July 2011. Retrieved 30 January 2010. ^ "Maggs Brothers" (PDF). The Private Library: Quarterly journal of the private libraries association. 4 (8): 161. 1963. Archived from the original (PDF) on 21 November 2008. ^ "Leslie Rowsell Moore". University of Bristol. Retrieved 30 January 2010. ^ "Sedge Moore". The Wurzels. Retrieved 30 January 2010. ^ "Los Campesinos at the Thekla". Bristol Rocks. Retrieved 30 January 2010. ^ "RootsWeb's WorldConnect Project: Somerset Coalfield Connections". wc.rootsweb.ancestry.com. ^ "George Rowdon". Cricket Archive. Retrieved 30 January 2010. ^ Dixon-Smith, Rosemary. "Missionaries: Selected brief biographies". Missionary World. Retrieved 30 January 2010. ^ "Dr DuncanSteel". Australian Centre for Astrobiology. Archived from the original on 13 October 2009. Retrieved 30 January 2010. ^ "Person - National Portrait Gallery". ^ "Geoffrey Tovey". The Telegraph. 20 December 2001. Retrieved 30 January 2010. ^ "Steve Voake". Faber & Faber. Retrieved 30 January 2010. ^ "Arthur Waugh". Find a Grave. Retrieved 30 January 2010. Wikimedia Commons has media related to Midsomer Norton. This page was last edited on 6 April 2019, at 20:32 (UTC).